This is a special episode on the complexities the Dorner case reveals. A lot of Black people (and Whites, Asians and Latinos) are treating Dorner as a hero. Some Black people are making the same mistake made when O.J. Simpson beat the wrap. Many who are frustrated by police who abuse their power see Dorner as a revolutionary of sorts. If you are not ready for an honest conversation about racism, police brutality, racial profiling, mental health and justice- don't listen. If you ready to be free from the Matirx, click play. Then we move on to talk about Chief Keef from Chicago. Another case of rappers doing dumb things. The good news is, he might grow up after this incident. Next we talk about the Hip-Hop Illuminati....spooky ain't it? Close the doors and windows before you listen. I'm about to keep it 100 in here!! NOTE: This show was recorded BEFORE today's incident in Big Bear. Chris Dorner appears to be dead. But much remains to be discussed. 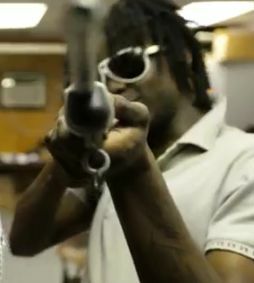 When keeping it real goes wrong: Rapper Chief Keef did time for being on probation and getting on video to pop off with guns at the range for the media. The Hip-Hop Illuminati have been a big discussion since I was a youngster in the rap game. Now its mainstream and everybody from Jay Z, to Lil Wayne, Obama and Beyonce are on deck. Lets look into it shall we?